In South Korea, Naver dominates the internet technology space. Here, the Naver portal website serves as a mainstream hub for just about every web-based activity, ranging from searches and shopping to blogs, news and maps. However, Naver is outpaced by its foreign rival Google in one key area — videos. Google-owned YouTube is currently Korea’s longest-used app and the primary tool used to share and watch online videos, according to Seoul-based app analytics firm WiseApp. With YouTube’s presence growing day-by-day, Naver has long struggled to find ways to expand its video sharing platform. And now, the portal thinks it can secure a competitive edge in the space tying videos into one its most influential and widely-accessed resources -- blogs. Naver announced Friday new measures to “drastically strengthen” the video element in its blogs, including a variety of fresh features to make video production easier and to ensure more widespread circulation. In doing so, Naver hopes to reposition itself as a convenient video-sharing site for both content creators and users -- a task that will be highly challenging considering YouTube’s reigning presence and user base in Korea. Naver’s decision to strengthen its video services via blogs is unsurprising, considering blogs are among the portal’s strongest content platforms and assets. When users makes a search on Naver, they are led to not just websites but also a list of blogs carrying information related to the topic, be it a particular product, restaurant, political event or activity. Given this, blogs are considered a vital part of Naver’s content pool and a major contributor to the portal’s web traffic. To now bring more videos into the picture, Naver’s blog system will adopt a series of new video-editing features. This includes voice separation tools, easy captioning and automated still-image extraction. Naver will also add title, description, and tag functions to videos, to ensure more videos are exposed through web and video searches. To help bloggers formulate multimedia content quicker, Naver also introduced the “auto transformation” feature in which images and videos are automatically generated in accordance with the text written by a blogger. Aiming to reach out to bloggers and content creators which are active on other platforms such as Instagram, YouTube and Facebook, Naver also introduced a “smart editor” system that lets bloggers recreate in the same format posts initially made on other third-party content platforms. The company also said it would revamp its ad profit-sharing model AdPost to provide expanded monetization opportunities to creators. Previously, bloggers could post ads only at the bottom of their posts. But now, they can freely display ads in any part of their post deemed most suitable, the firm said. As for users who are consuming videos via Naver, the Korean internet giant will employ artificial intelligence engines to make better video recommendations and to show the most relevant video ads to its users. For the most part, ad experience for users will remain unchanged. Naver did not disclose plans to shorten the duration of the 15-second ads that are shown before a video, which many users have complained is too long compared to YouTube’s pre-roll ads that can usually be skipped after 5 seconds. 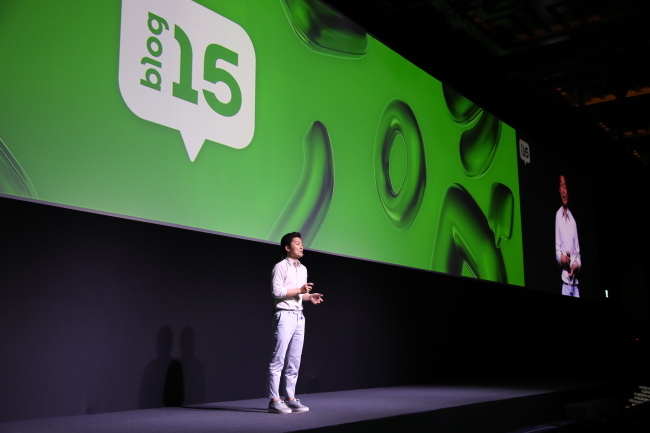 To lead the changes, Naver has created a new unit dedicated to improving the firm’s blog service. Named APOLO, the unit will function as a company-in-company that oversees the portal’s various user-generated content platforms, most notably blogs and videos. “We plan to continue developing new technologies to make blogs a better platform for displaying and sharing diverse forms of user-generated content including text, videos and images,” said APOLO’s new chief Kim Seung-eon in a statement. Whether Naver’s efforts will translate to gains in the video-sharing platform business remains to be seen. What is for sure is that it won’t be an easy task as the latest statistics show that YouTube has an undisputed lead in the market. 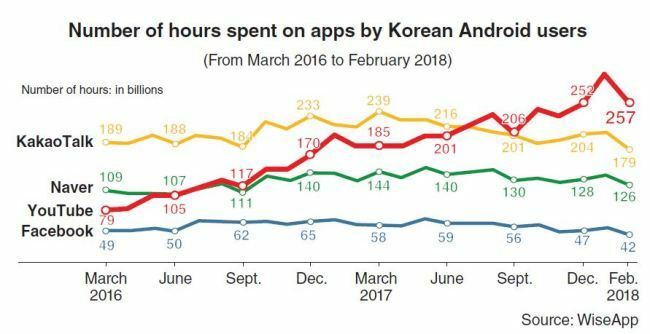 According to WiseApp’s March data, Koreans spent the longest amount of time on YouTube than any other app, including the country’s top-used chat app KakaoTalk, Naver and Facebook. In March, Korean users spent 25.8 billion minutes on YouTube, far outrunning the total time spent on the other three apps during the month — 18.9 billion minutes on KakaoTalk, 12.6 billion minutes on Naver and 4 billion minutes on Facebook. The total amount of time Koreans spent on YouTube last month tripled from March 2016, when they spent just 7.9 billion minutes on the app.